When the novel by Mary Shelley was adapted to film, it met with great success. The underlying themes are plentiful, particularly focusing on a man's misguided motivations to create life, illustrating the dire consequences of trying to play God. 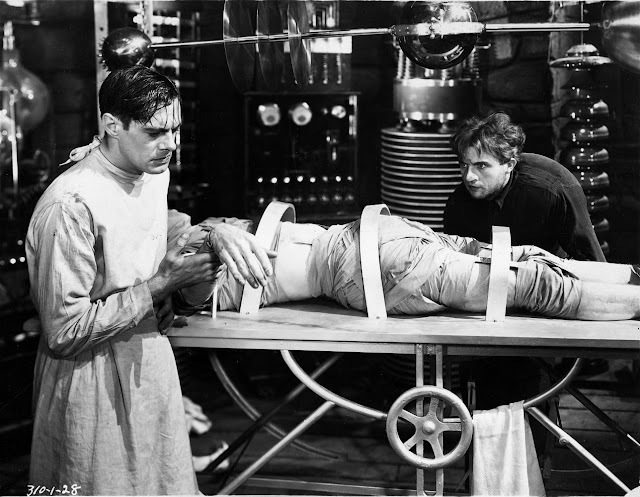 When Victor Frankenstein shouted "It's alive, it's alive," he didn't know this wasn't necessarily a reason for celebration. Dr. Victor Frankenstein is obsessed. Fascinated by science and spurred on his own intelligence, he seeks the ultimate power by creating a living being out of scattered body parts. Eager to revel in sharing with the world a person he breathed life into with his own two hands, he doesn't stop to ponder the grave consequences. For when the eyes open and the brain functions, the good doctor sees defeat and tragedy in the eyes staring back. Realizing that he has made a horrible mistake and unable to look at what he thought would have been his greatest achievement, he instead shuns his created child and tries to avoid the errors of his ways. Like an absentee father, he shuffles away, hoping that out of sight and out of mind may mean out of existence. We know this isn't so, and he soon finds he can't escape the monster he's created. There's really no need to retell the whole story, as it's clearly a well known one that has imprinted its memory in the minds of numerous generations. Karloff's childlike and confused monster is a face that's mandatory recognizing by the time a child is ten. Costumes are still adorned in his image at Halloween, Universal is still shoveling out statutes and stuffed animals and masks, and dozens upon dozens of horror flicks have either references or inspirations from this influential film. One of my favorite references is in Bride of Chucky when Chucky tosses a TV playing Bride of Frankenstein into the bathtub with Tiffany, electrocuting her to death. When the monster first has life bolted into it from lightning, to his shuffling and buffling walk, he's addictive and it's easy to see why he's an idol even to this day. Karloff did an admirable job bringing an undead character to life, and Pierce's makeup work was astonishing, particularly for that day and age. It's a shame it was so hard on the poor actor, though, as in addition to his small paycheck he earned back problems. Science and the dangers of messing with things man shouldn't are highlighted clearly here. After this film many more went on, and still will, to showcase this in their own way. Even if this film no longer frightens or disturbs, it's still intriguing, fascinating, and full of moral lessons that will always ring uncomfortably true. The atmosphere is dark and surrealistic, filled with rich cinematography, gothic styled imagery, and painted with shadows and depth. Director James Whale was creative with his foreshadowing and subtle camera moves. There isn't much of a score here, but sound effects are used effectively when needed, such as the ringing of a bell. Colin Clive as the doctor overacts big time, but it's suitable in this case. When he has the manic and obsessed glee in his eye, it's easy to feel his enthusiasm. When he mourns and regrets, it's clear as day to feel that too. 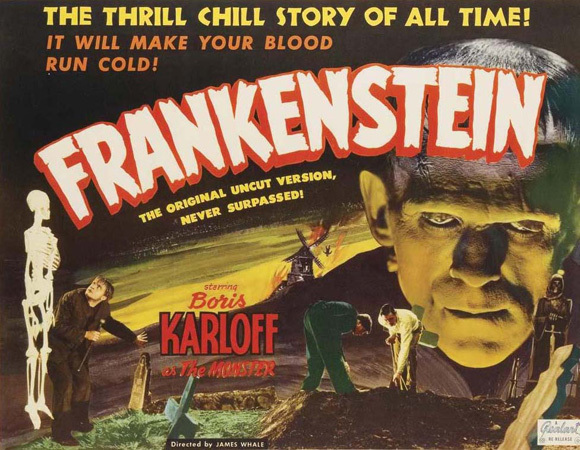 Frankenstein was one of the big Universal hits of the 30's, retaining serious vibes that are clear from the start, with a fast enough pace to not bore the viewer. The social commentary is easily recognizable, although may seem to get different interpretations, resulting in countless papers being written on this movie alone. 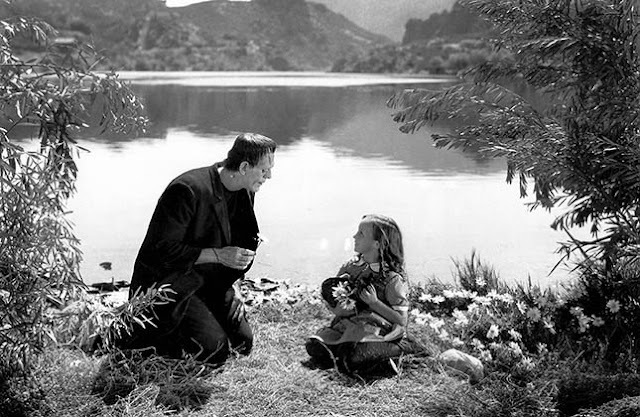 Unlike the fanged Dracula, Frankenstein was intended to be more of a sympathetic creation, showing that society may actually be the more monstrous of the two. This classic never out lives its welcome. Even today it's a wonderful journey through cinema history, and I for one had great fun watching the monster be born again, only to see his depressing demise, and absorb all that this film teaches us. If you haven't seen Frankenstein, make it a goal to remedy this. It's worth it for all ages, no matter what the decade. Stories such as this never lose their appeal. In the book a lot of the details are vague or completely unknown as to how the monster was actually made with the body parts. The movie focuses more on this with adding invented details. Also the lightning plays a larger part in the movie with the maddening "It's Alive" Battle cry and Igor companion. In the book Frankenstein's monster kills his creator's lady love with strangulation, but in the movie the brutality is increased when he rips out her actual heart. Henry and Victor's relationship is strong and lengthy, being spawned in childhood, but in the movie they meet at the University. The book has a lot of the focus being in the arctic depths, while the original movie leaves this out. This will omit sea captains as well. In the book the doctor destroys the female counterpart immediately but in the original movie this did not happen or advance. That is saved for Bride of Frankenstein, a completely invented storyline. The novel has the monster destroy more of Frankenstein's family, where they follow each other to the ends of the Earth seeking to destroy one another. 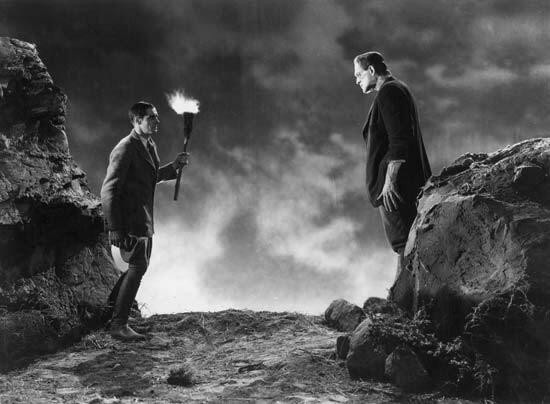 In the movie the deaths are less, and Frankenstein is not chasing the monster. In the book the monster taught itself speech, but not in the movie. I'm glad the movie kept the original theme of man playing God and abandoning his creation. The book is the winner. Both are beautiful, both are potent, but the book is slightly more so since it delves deeper into tragedy and internal angst. Both deal with moral implications and controversies, but the book digs deeper. Still, the movie did give us fresh and enjoyed inventions such as the intriguing Igor, the lightning strikes surrounding the fated laboratory, and the deranged speeches and strong animations of the good doctor. Long live on, BOTH versions.